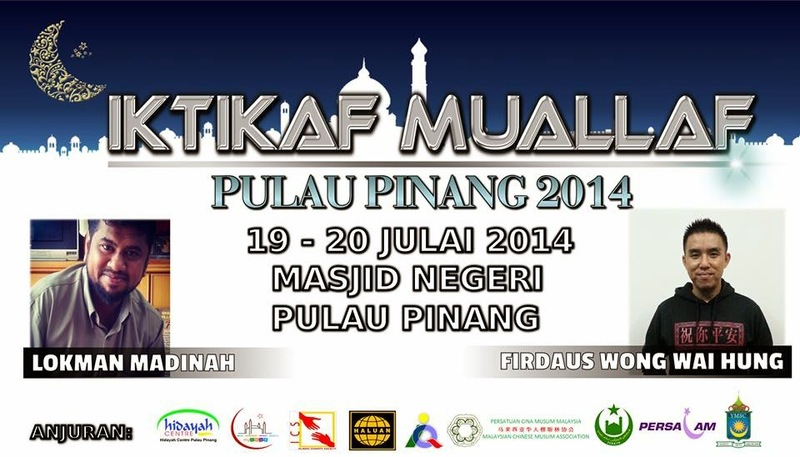 Last weekend 19 and 20 July 2014, we had a program in Masjid Negeri Pulau Pinang combining a few others NGO, i.e. Hidayah Centre, IKUT, IQ, PERKIM, YMSC, HALUAN, ICS, PERSALAM and also MACMA Penang. Some of our reverted brothers were experiencing their first time 'itikaf inside masjid. The word 'itikaf (اعتكاف) means staying inside masjid and remembering our Creator- Allah. We had our lovely brother Lokman shared an important topic with us on his kuliah dhuha, entitled kewajipan berpuasa. We learnt about the importance of fasting in Ramadhan brings us closer to Allah SWT and being more passionate to mankinds by experiencing hunger. On Sunday we had a session with brother Firdaus Wong Wai Hung on the beauty of Al-Qur'an and As-Sunnah. Learning alot lessons from Al-Qur'an, the guidance to mankind. Islam is such a simple and beautiful way of life. Six MACMA committees posting with their new T-shirt. Anyone who are interested to buy do drop us message!